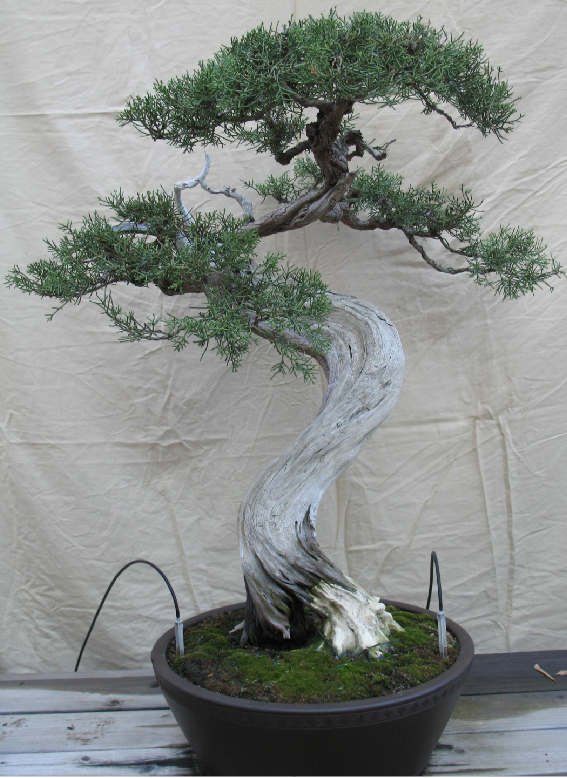 John Naka was one of the first to recognize the value of having a bonsai collection in Southern California and donated this juniper to Safari Park at the beginning of the original Pavilion development. The tree is named “Moryu” (Brave Dragon) and was featured with John in the November/December issue of Golden Statements (Golden State Bonsai Association magazine). John Naka dedicated the tree at Safari Park (then Wild Animal Park) in May 1987. After many years, John repaired the base with concrete, removed most of the prominent jin, changed the front, and completed restyling. John, his wife, and friends rededicated the tree at Safari Park in 1997. In recognition of the John’s great contributions to bonsai, the Park declared the day to be John Naka Day and awarded John a medal and certificate. Steve Valentine, on behalf of the San Diego Bonsai Club, gave John a plaque and the thanks of the Club.